It was in the ballroom that Victorian society was on its best behavior. Everything there was regulated according to the strictest code of good-breeding, and as any departure from this code became a grave offense, it was indispensable that the etiquette of the Victorian ballroom was thoroughly mastered. The following hints on 19th century Victorian ballroom dancing concentrate on the period from the 1840s to the mid-1860s. PREPARATIONS: There were various ways of organizing a Victorian ball — the most common one was for several people, interested in dancing, to meet together and choose a Committee of Arrangements or Managers, as they were sometimes called. It was their duty to procure a hall, engage a quadrille band, make arrangements for the supper, and issue invitations to those they wanted to attend the dance. It was the special duty of one or more of the committee to attend to each of the above duties for the Victorian dance. The number of the committee varied from five to twenty, according to the amount of services to be performed. If the invitations for the dance were to be sent to adjoining towns, at least one of the committee was chosen from each town, or in case there were several villages in the town, one from each village. 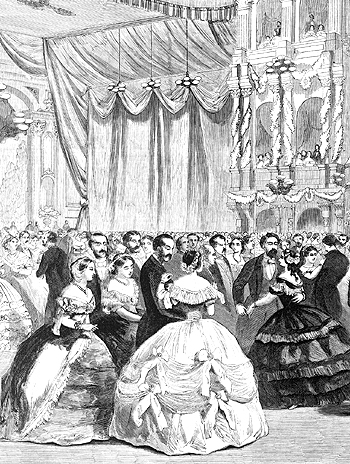 On the evening of the Victorian ball, two or more of the committee would be chosen as ballroom dancing floor managers, to see that the sets were full, and that all persons wishing for dancing partners were supplied; and also to direct the music, as well as to decide any questions that may arise in the Victorian ballroom. Victorian military and fire engine companies, clubs and associations often gave a single dance or perhaps a series of parties—the same committee officiating during the different evenings. Furthermore, it was the custom for teachers of ballroom dancing, in connection with their schools, to open their rooms to the public after nine o’clock in the evening. Any proper person could, for a small sum of usually fifty cents, join in the amusements. These Victorian parties usually ended at about twelve o’clock, while Victorian dances generally continued some hours later. Sometimes Victorian balls were organized by some speculator, who generally managed the whole matter himself. Victorian balls of this class were not always select, as the invitations were given to the public in general, and persons deemed “improper” too frequently gained admission. Refreshments would be provided for the guests during the evening; and, as nothing would be passed around the Victorian ballroom, a refreshment room was absolutely necessary. Provided in the refreshment room was tea and coffee, ices, biscuits, cakes, cracker-bonbons, cold tongues, and sandwiches. If a regular supper was served it would be laid in a separate room. To order it in from a confectioner or caterer was the simplest plan, but it often proved somewhat expensive. If provided at home, it was done on a liberal, but not vulgarly profuse, scale. Substantial fare, such as fowls, ham, tongue, etc., was absolutely necessary. Jellies, blanc-mange, trifle, tipsy cake, etc., would be added at discretion. Nothing upon the table would require carving; the fowls would be cut up beforehand, and held together by ribbons. Whatever could be iced would be served in that way. A Victorian lady, in dressing for a ball, first needed to consider the delicate question of age; and next, that of her position, whether married or single. She would then reflect on the simplicity of her attire, the elegance of the design of her gown, and then the propriety of colors. As everything about a Victorian ballroom would be light, gay, and the reverse of depressing, it was permitted for elderly ladies who did not dance to assume a lighter style of dress than would be proper at the dinner table, concert, or opera. The gown of the married and unmarried lady, however youthful the former, would be distinctly marked. Silk dresses were, as a rule, objectionable for those who danced; but the married lady could appear in a moiré of a light tint, or even in a white silk, if properly trimmed with tulle and flowers. Flowers or small feathers were stylish for the head; jewelry would be very sparingly displayed, a single bracelet was quite sufficient for those who danced. Young unmarried ladies would wear Victorian gowns of light materials — the lighter the better. Tarlatane, gauze, tulle, areophane, net, the finest muslin, lace, and all similar fabrics, were available; such Victorian dresses would be worn over a silk slip. Victorian ladies in deep mourning would not dance, even if they permitted themselves to attend a Victorian ball. For those in mourning, black and scarlet or violet was the proper attire. When the mourning permitted dancing, white with mauve, violet or black trimmings and flounces was proper. A black satin dress looked best when covered with net, tarlatan, or crape—the latter only to be worn in mourning. In the selection of colors a lady would consider her figure and her complexion. If slender and sylph-like, white or very light colors were generally suitable; but if inclined to be plump, these colors would be avoided, as they had the reputation of apparently adding to the hulk of the wearer. Moreover, the harmony of Victorian dress involved the idea of contrast and would be chosen with reference to the wearer; thus, a blonde appeared to most advantage in delicate hues, such as pink, salmon, light blue, maize, apple green, white, and so forth. The brunette would, on the contrary, select rich and brilliant colors. The head-dress for the evening would be in unison with the Victorian gown, though ladies who had a profusion of beautiful hair required little or no artificial ornament; a simple flower was all that was necessary. To those who were less gifted in this respect, wreaths were generally thought becoming. A tall lady would avoid wearing anything across the head, as that added to her apparent height. A “chaplet” or a “drooping wreath” would, therefore, be preferable. All the accessories for the evening — gloves, shoes, flowers, fans, and the opera cloak—would be fresh and new. Inattention in this matter spoiled the effect of the most impressive gown. White gloves were appropriate for the Victorian ballroom: in mourning they were sewn with black. The gloves would be faultless as to fit, and never be removed from the hands in the ballroom. It was proper for those who dance to be provided with a second pair to replace the others when soiled or in case they split, or if the buttons came off. White satin shoes were worn with light colored dresses; and black or bronze with dark dresses. It was also stylish for boots to be worn in the ballroom; these were of kid, satin, or silk, either white or matching the dress in color. The attire in which a Victorian gentleman could present himself in a ballroom was strictly defined. He would wear a black superfine dress-coat, pair of well-fitting pants of the same color, and a black or white vest. The Victorian ball-suit would be of the very best cloth, new and glossy and of the latest style as to the cut. The	waistcoat would be low, so as to disclose an ample shirt-front, fine and delicately plaited; it was not embroidered, but small gold studs were used for decoration. He would also have a black or white cravat, tie or stock—the necktie would be of a washing texture, not silk, and not set off with embroidery. In addition, included were a pair of patent leather boots with low heels; white kid gloves–not straw-color or lavender; and a white linen cambric handkerchief. The hair would be well dressed, without too many curls; the whole effect would be in perfect keeping with the general appearance. Excess of jewelry would not be worn: simple studs, gold solitaire sleeve-links, and a watch chain—massive with charms and appendages. Perfumes would be avoided as effeminate; if used at all, only for the handkerchief, they would be of the very best scent so as not to offend. In calling for the lady invited, the Victorian gentleman would be punctual at the hour appointed. If he ordered a carriage, he handed her in first, and sat opposite to her unless she requested him to change his position. They were not obliged to go exactly at the appointed hour; it was even fashionable to go an hour later. Victorian married ladies were accompanied by their husbands; unmarried ones by their mother or by a chaperon. In leaving the carriage, the Victorian gentleman preceded the lady and assisted her in descending, he would then conduct her to the ladies’ dressing room, leaving her in the charge of the maid, while he went to the gentlemen’s apartments to divest himself of overcoat, hat, and boots. The lady in the meantime, after arranging her Victorian dress, retired to the ladies’ sitting-room or awaited the gentleman’s arrival at the door of the dressing-room. A cloak-room for the ladies was usually provided, with one or two maids to receive the shawls or cloaks. The maids would also render any assistance in the way of arranging hair or dress, repairing a torn dress, or any necessity of that kind. In this room there would be several mirrors, with a supply of hair-pins, needles and thread, pins, and similar trifles. A hat room for Victorian gentlemen was also available with tickets, numbered in duplicate for the articles belonging to the ladies and gentlemen that were left in the charge of the attendants. With two tickets of each number, one of these was pinned on the coat or cloak as it was handed in, and the other given to the owner. By this means the property of each guest was identified, and confusion at the time of departure was prevented. The floor-managers gave the order to the orchestra to commence, and also took the lead in entering the Victorian ballroom. The Victorian gentleman either joined in the promenade, or conducted his lady to a seat. 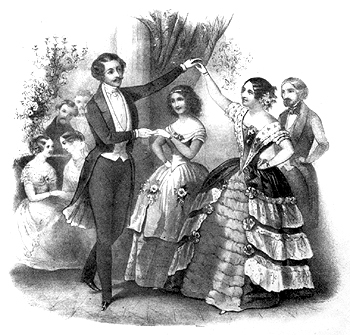 Upon entering the ballroom, the gentleman’s first duty was to procure a program for his partner, and to introduce his friends, who placed their names on her card for the dances engaged. The sound of a trumpet was generally the signal for the assembly to take their positions on the floor for dancing. A gentleman would, in all cases, dance the first set with the lady in company with him, after which he could exchange partners with a friend; or dance again with her, as circumstances or inclination would dictate. A Victorian lady could not refuse the invitation of a gentleman to dance, unless she had already accepted that of another, for she would be guilty of an incivility. Ladies who danced often, would be very careful not to boast of the great number of dances for which they were engaged in advance before those who danced but little or not at all. They would also, without being seen, recommend these less fortunate ladies to gentlemen of their acquaintance. At a private ball or party, a lady would show reserve, and not show more preference for one gentleman than another; moreover, she would dance with all who asked properly. The master of the house would see that all the ladies danced; he would take notice particularly of those who appeared to be wall-flowers, and would see that they were invited to dance. But he would do this wholly unperceived, in order not to wound the self-esteem of the unfortunate ladies. Gentlemen, whom the master of the house requested to dance with these ladies, would be ready to accede to his wish, and even appear pleased at dancing with the lady recommended. Frequently, some young Victorian gentlemen breached the rules of proper etiquette; they were so very particular that they considered it a remarkable inconvenience to dance with a lady unless she happened to be very pretty and interesting. Those young men rarely brought ladies with them, and were constantly bothering their friends and the floor managers to be introduced to the best dancers and the prettiest young ladies that they saw in the room. If there were not as many gentlemen as ladies present; two ladies were permitted to dance together in order to fill up a set, or two gentlemen could dance if there were a shortage of ladies. But it was not proper for ladies to refuse to dance with gentlemen, and afterwards dance together, or for gentlemen to do the same after having refused to be introduced to ladies. Engaged persons would not dance together too often; it was in bad taste; furthermore, it was considered a violation of etiquette for man and wife to dance together. 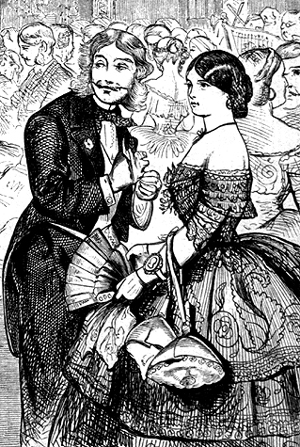 When introduced to a lady, a Victorian gentleman was particular about how he asked her to dance, and the manner in which he bowed to her, and also of requesting to see her card; ladies were susceptible of first impressions, and it depended a good deal upon the manner in which the gentleman first presented himself. In requesting a lady to dance, he stood at a proper distance, bent the body gracefully, accompanied by a slight motion of the right hand in front, he looked at her amicably, and respectfully said, “Will you do me the honor to dance with me;” or “Shall I have the pleasure of dancing with you;” or “Will you be pleased, or will you favor me with your hand for this or the next dance.” He remained in the position he had assumed until the lady signified her intention, by saying, “With pleasure sir,” or “I regret I am engaged sir.” The gentleman would then place his name on her card, and after having made the necessary arrangements, he would politely bow and withdraw. When a Victorian gentleman danced with a lady to whom he was a stranger, he was cautious in his conversation. When the music ended, he bowed to his partner, presented his right arm, and led her to her seat; if the seat was occupied, he would politely ask her to what part of the hall she would like to be conducted; he would also bow as she took her seat. The gentleman was not at liberty to sit by her side, unless he was on terms of intimacy. Would he wish to dance with a lady with whom he was not acquainted, he applied first to his friends, who would try to procure for him the desired introduction. If not, the Victorian gentleman would make application to one of the floor managers, who would introduce him if he was acquainted with the lady; otherwise the floor manager would not present him without first demanding the consent of the lady. The etiquette of the ballroom differed slightly in the country. In country ballrooms, generally a gentleman would ask any lady to dance with him and, after an introduction, could enter into conversation or promenade with her through the room without being considered guilty of breeching proper etiquette. Victorian gentlemen would attempt to entertain the ladies who danced with them with a little conversation, hopefully more novel than the weather and the heat of the room; and in round dances they would be particularly careful to guard them from collisions, and to see that their dresses were not torn. A gentleman would not engage a lady for more than four dances during the evening, as it could deprive her of the pleasure of dancing with those of her friends who may arrive at a later hour; besides much familiarity was out of place in a ballroom. At the end of the dance, the gentleman conducted the lady to her place, bowed and thanked her for the honor which she had presented. She also bowed in silence, smiling with a gracious air. 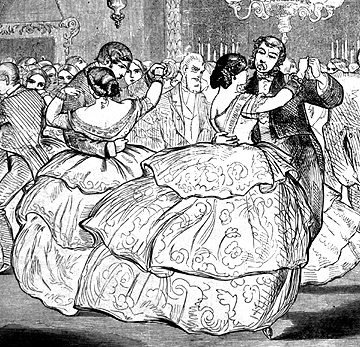 Nevertheless, no Victorian gentleman could take advantage of a ballroom introduction because it was given with a view to one dance only, and would certainly not warrant a gentleman in going any further than asking a lady to dance the second time. Out of the ballroom such an introduction had no meaning whatsoever. If those who had danced together met the next day in the street, the gentleman would not venture to bow, unless the lady chose to recognize him—if he did bow, he would not expect any acknowledgment of his greeting nor take offense if it was withheld. In a private Victorian ball or party, it was proper for a lady to show reserve, and not manifest more preference for one gentleman than another— she would dance with all who asked properly. Ladies would avoid talking too much during the dance; it was also in bad taste to whisper continually in the ear of her partner. Ladies would avoid affectation, frowning, quizzing, or the slightest indication of ill-temper. No loud laughter, loud talking, or staring would be seen in a lady’s behavior. It was recommended that every lady stop dancing the moment she felt fatigued, or had any difficulty in breathing. Married or young ladies could not leave a ballroom, or any other party, alone. The former would be accompanied by one or two other married ladies, and the latter by their mother, or by a lady to represent her.